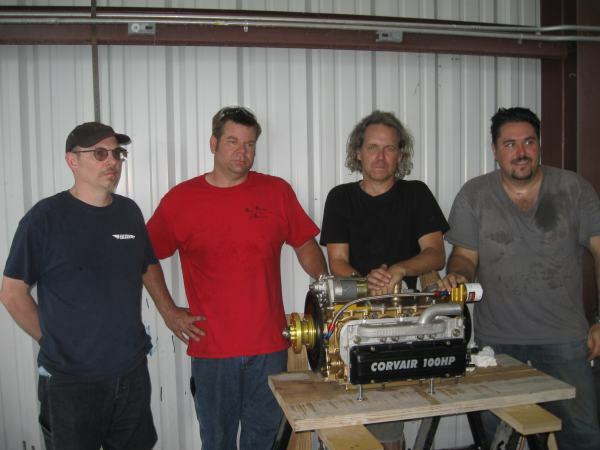 In the above photo, from left to right, Spencer Gould, Dan Weseman and Mark “Petz” from Falcon Machine at work on Spencer’s engine at Corvair College #23. Dan is covering the installation of his 5th bearing onto Spencer’s engine. Originally built as a plain 4 bearing engine, Spencer elected to add Dan’s bearing, a fairly easy upgrade that does not require the engine to be disassembled. Dan’s presentation on how to do the process complemented the clear directions that come with his bearing. Above is the same process from a different angle. Here the prop end of the engine with the Safety Shaft is sticking straight up. Installation is easier on the bench, and it is easiest if the pistons and rods are not yet installed, but Dan has demonstrated many times that the upgrade to his bearing can be done without ever removing the engine from the airframe. He now has well over 200 bearings in the field, and they have been proven over 5 years of service. Upgrading an engine requires a shorter hub to keep the same length of Studs, Shaft and cowling. The Wesemans offer this machine service to builders who already have one of our Black Hubs or a Standard length Gold Hub. Builders that are planning on using a Dan bearing from the start order a Short Gold Hub from us. Above, is a good look at the clean lines of an engine equipped with a Front Starter and alternator. Note that the engine has just one oil line on it, running from the Gold Housing to a Weseman Bearing. In its final installation, the engine will have a Gold Sandwich between the Filter Housing and the filter, and two short lines feeding a large cooler mounted on the engine baffling. This is another view of our new Starter Bracket. The outboard side of the triangular bracket is slotted allowing the adjustment of the starter engagement. This eliminates the previous system that had a drilled link plate. Spencer’s engine has the oil fill in the top cover because it is going on his single seat design, and he is planning on a form fitted cowling that would come too close to the right hand valve cover to have room for our standard oil fill location. The left hand valve cover has our standard crankcase vent line and oil return. The engine uses our Short Gold Hub because it has a 5th bearing. The bearing is one of the Weseman’s original cast housings, before they went to billet CNC production. Another view of the engine. The welded on intakes were welded on the heads by Mark Petz at Falcon Machine. Like most flying Corvairs, Spencer’s engine has one of our E/P Distributors. Oil filter is a K&N 1008, the plugs are AC-R44Fs, my first choice for both of these. The dip stick is an aftermarket one for a 289-302 Ford, with the tube shortened 5″. The engine hardly needs more than a set of ignition wires and a baffle set to be installed on an airframe. None of the engine systems need to be mounted on the firewall: The engine is largely a self-contained, neat package. The engine will be flown with a HD oil cooler because the airframe is designed for strong maneuvers and solid acrobatic work, and excess oil cooing makes sense on a plane that will be flown at full power and slow climb speeds. On the run stand, engines can be operated without oil coolers because the oil comes up to temp very slowly with the engine uncowled. Above, Spencer’s engine at power on the stand. Note the size of the cooling baffle we use on any engine we are running on the ground. We recently had a builder extensively damage the engine he built by running it on the ground without any type of cooling baffle or cowling. In every photo we have of running engines at the Colleges, especially brand new ones being broken in, they have a generous amount of cooling air being pumped through them by the baffle. Prop wash over an uncowled engine does not work, period. Without a cowl or a cooling baffle box, none of the air has any reason to flow down through the cooling fins on the head. How long does it take to hurt the engine? How much running is OK? Answer the question for yourself this way: If you just spent $5,000 and a lot of time to rebuild the V-8 in your classic muscle car, how long would you run it without a radiator? Actually this isn’t a fair comparison. A v-8 in neutral turning 2,000 rpm is only making 10 or 15 hp, it is not pulling any load. It has a several hundred pound mass and lots of oil to heat up. Conversely, a Corvair with a flight prop turning 2,000 rpm has to be at half throttle and may be making as many as 60 horses. It doesn’t have the mass to heat soak either. You could run the V-8 longer without damage. Keep in mind, if you hurt your newly overhauled v-8, it may leave you by the side of road later. If your flight engine is wounded by cooking it during break in, it may choose to get even with you later, and it is much more likely to do so on a full power climb out than it is idling on the ground. In the end, what exactly was to be gained by running the engine on the ground without cooling? Building a box too much work? Few scraps of sheet metal cost too much? Building the most elaborate cooling box will never take 10% of the time nor 5% of the cost of rebuilding your engine. The longest time I ever run an engine without a cowl or cooling box (once it is fully broken in) is 45-60 seconds, and only 5-10 seconds of this are much above idle. I would do this while setting the timing on an engine after maintenance. On many of our cowling designs like the Zenith cowls, you can just pull the top hinge pin on the passenger side and remove the top access panel. The cooling system will stay in place with the exception of a 4″ square hole. You will have full access to work with the Distributor and set the timing. Our cowling design took factors like this into consideration, and that is why it makes a lot more sense than trying to scab together a cowl from leftovers of some other engine. 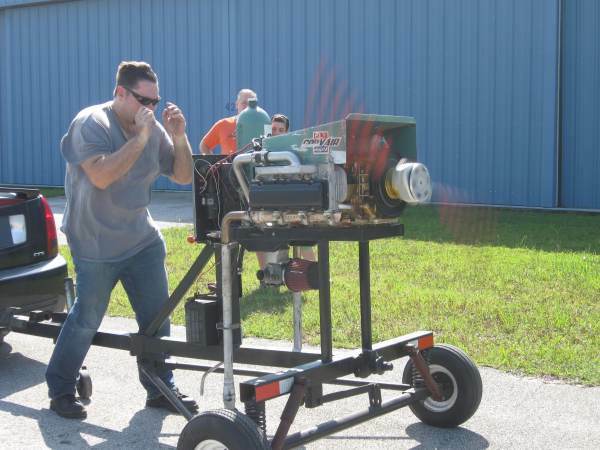 Above, Spencer enjoys the finest form of air-conditioning on the planet, prop blast from an aircraft engine created by your own hands. A close look at the exhaust on the run stand shows that I have oxygen sensors on both sides to run an air/fuel meter (lean-rich gauge). Initially, I liked the idea, and a number of well-known Corvair pilots like this instrumentation as well. Here is the turn off for me: The sensor works on a tiny signal difference, and it is very prone to any type of grounding issue. This is a pain, but not too hard to overcome. My real objection it that when the device loses its signal, its default position is reading perfectly in the green arc. I find the very concept annoying. Would you use an oil pressure gauge that indicated 45 pounds every time the wire was disconnected? How about a fuel gauge that always read 1/3 full when it was having an issue? To me, I want instrumentation that when it fails, it clearly indicates that it is dead, it doesn’t provide misleading info. There is probably some electrical reason why the air-fuel meter reads green when it is dead that makes sense to an engineer at a computer, but if I put it in a plane, it has to make operational sense to me. Lest you think I am making a mountain out of a molehill, than consider that the airliner hitting the 14th street bridge in D.C. was primarily caused by an instrument error on the EPR gauge; the airliner that went into the Everglades 30 years ago had the crew fixated on a failed instrument light; there are enough stories about professionals being undone by faulty instrument data that homebuilders should consider this issue with attention. In my personal opinion, almost any Corvair engine can be well served by 2 simple EGT probes in the exhaust. EGT systems are stupid reliable, and when they are disconnected they don’t read. Above four of the major contributors to the modern Corvair movement: From left, Mark from FalconMachine.net, Dan Weseman from SPA.com, myself, and Spencer Gould. Today, Spencer’s day job is aeronautical engineering for the world’s greatest aircraft powerplant company, Pratt-Whitney. Contrary to the popular image of serious engineers being challenged by practicality, Spencer is a multi-faceted renaissance man of aviation. He is a very skilled pilot of complex aircraft, he is the master of CAD drawing and machining, he can fly any RC aircraft with skill, he has designed and flown dozens of them. He designed and has built 98% of his own composite acrobatic aircraft, the SP-500, and has a broad array of practical knowledge in the world of aviation. If you need a technical solution to a structures issue, a finite element analysis, or a process, Spencer always has valid input. 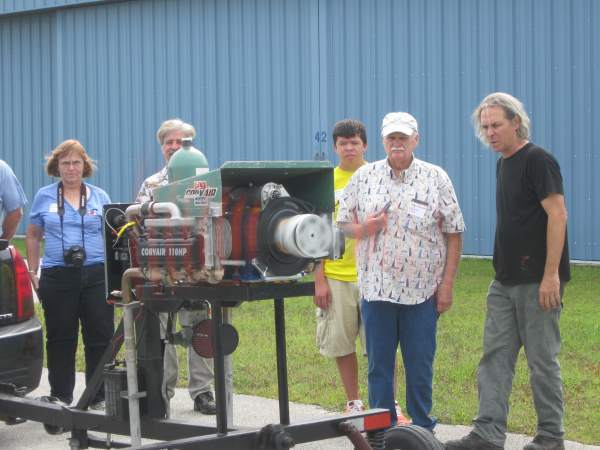 In the years between his graduation from Embry-Riddle Aeronautical University and Pratt, he worked as a powerplants engineer for Piper in Vero Beach. During that time, Spencer was an adjunct member of The Hangar Gang, and covered a lot of our CAD work. Designs that I had for the Gold Oil System, the modern Hubs and our 5th bearing were refined by Spencer’s CAD ability, and they went directly to CNC production from code we e-mailed to the machine shop. He was and remains a very important force multiplier in our efforts, an asset that few other engine programs could claim to match. Oshkosh 2012. Our booth is between Zenith and Sonex. We will be at Oshkosh from July 23 to July 29, 2012. Our Booth Number is 615 in the North Aircraft Display Area, between Zenith and Sonex. We will have our full Catalog of Parts on hand. However, we will have limited quantities of some items such as Motor Mounts, Intake Manifolds, and Stainless Exhaust Systems. If there is a particular item you would like us to bring, please contact us. If you purchase them in advance, we will reserve it for delivery at the show. As always, we are more than willing to inspect any customer’s core engine or part, and we will gladly cover any procedure in detail and discuss any building or installation issue. Please bring photos of your project. Ken Pavlou and Dan and Rachel Weseman are planning a cookout. As we get closer to Oshkosh, we will have more information on FlyCorvair.net, our news site. Here is another builder’s story from Corvair College #23. 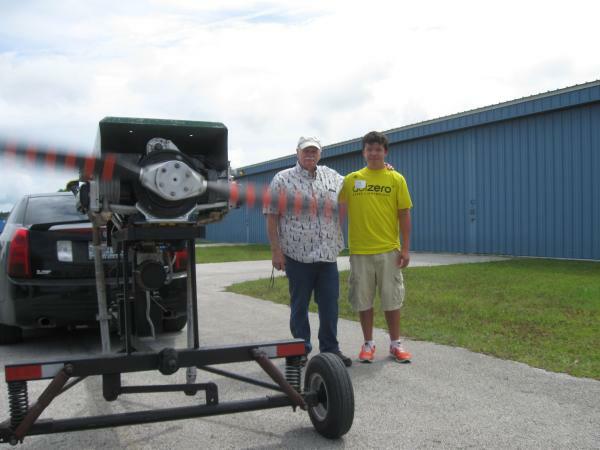 Below is a sequence of photos of the 2850 cc 110hp engine we assembled for Zenith 750 builder Roger Grable from Missouri. All of the action pictured took place at the College. We met with Roger and his wife Sarah at CC#22 in Texas a few months ago. It didn’t take long to understand that he knew engines fairly well, and had considerable experience working on them. His questions were observant and thoughtful. He spent #22 carefully considering a plan that made sense for his project and timetable. By the end of #22, Roger made the decision that he wanted to have us assemble a 2850 for him, and this would keep his fast paced 750 project moving. I have no problem building an engine for a guy with Roger’s approach. He still wanted to learn as much as possible, and that in my book is what makes him a good Corvair guy. 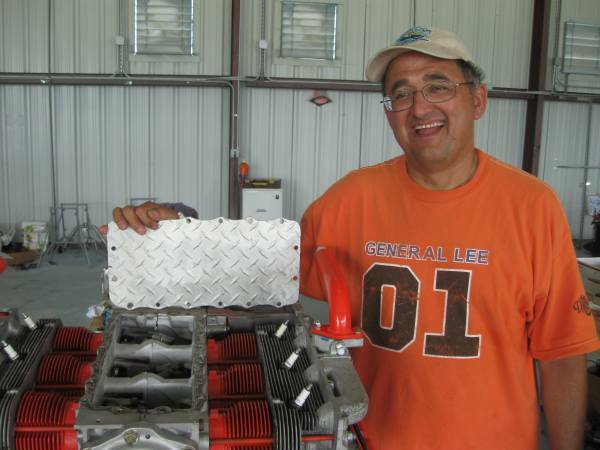 Above, Roger and I stand beside his engine on the run stand. Every engine we run has the oil system primed for 20 minutes with an electric drill. The only oil we use for break in is Shell Rotella T 15w-40. In every engine we add ZDDP. You can get it from a lot of places, but Clark’s sends it with camshafts they sell. We run the engine for 25 or 30 minutes without stopping, at 1500-2000 rpm. This has proven over hundreds of engines to protect the cam and lifters, which are the primary thing you are concerned with during the first hour. Above, a number of the builders at CC #23 admire the smooth power of Roger’s 2850. The engine is equipped with a billet Weseman bearing and a very nice set of Falcon heads. We configured the engine for a heavy-duty oil cooler. On aircraft like Zenith 750s, the slow climb speed capability and the high angle of attack challenge the stock oil cooler capacity in hot weather. Thus, we set the engine up with a cooler block off plate and a Gold Sandwich Adapter and a 20003 series aircraft oil cooler. The baffle kits the Wesemans offer are fitted for either the stock cooler or the 20002 or 20003 series. When complete, the oil system is contained on the engine, none of it is mounted on the firewall or cowling. This gives the engine installation a clean, organized appearance. Above, Roger keeps an eye on the oil pressure. 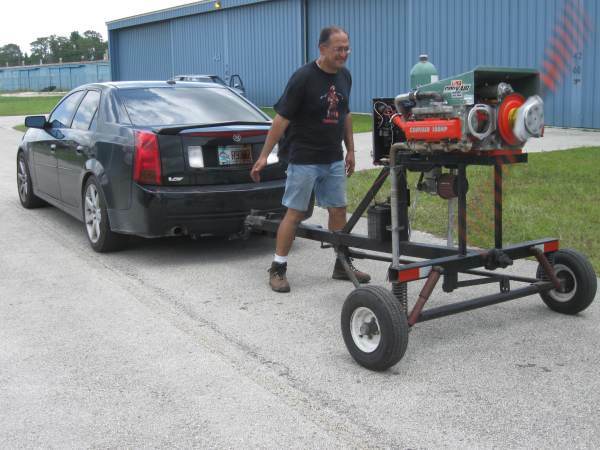 His engine is equipped with our new high volume pump. For these, I carefully use the mill and expand the capacity of the oil pressure bypass, to prevent the engine from having a very high peak oil pressure on start up with cold oil. When the engine is first started, several minutes of operation to warm the oil is a good idea, and we do this at 1000-1200 rpm. In a few minutes the oil will regulate at 50 psi or so. When the engine is at full temp, this will settle down to 45 pounds of pressure. This slight reduction in regulated oil pressure between 140 and 205 degree oil is a Corvair characteristic. Beside Roger in the yellow shirt is his grandson Graham of Kansas. The young man proved to be very smart and good company. Many of the builders though Graham was 20 or 22 years old by his manner; it was a small surprise that he is far younger, still in high school. He is very interested in flying, and it is easy to guess that he will do very well. The kind of younger person who defies all the common media stories about youth. We often get inquires about complete engines. Most of these are from people who only know about the low price of the engine. They have no other attraction, they know almost nothing of our development or support. Experience has taught me that any guy who decides to buy an engine he never heard of before after reading a one paragraph news release is not a guy who is in things for the long haul. Any guy who thinks you’re a genius in 1 minute is just as likely to decide you’re a fool without reason. Steady people who consider merits thoughtfully are typically the people who succeed in homebuilding. To understand an extreme case of people who are only interested in price shopping, I had a guy ask about a 3,000cc engine. 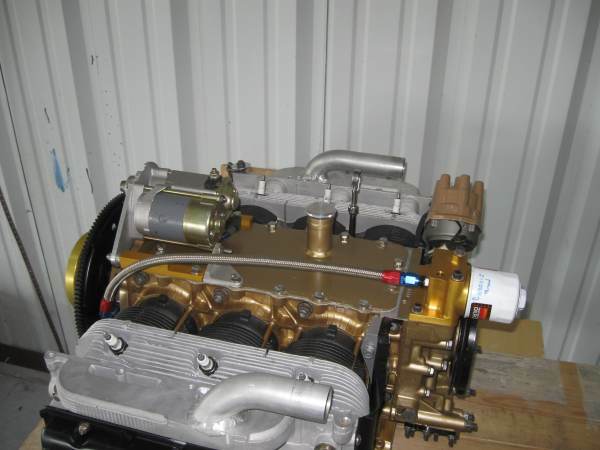 He said it was priced at $50 more than his other choice, a four-cylinder, geared, tiny displacement computer controlled, imported car engine. I pointed out that philosophically these were radically different concepts in aircraft engines, and he needed to think his choice over a bit. His response was to ask if I would sell him an engine but not the Conversion, Installation and Operations manuals, so it would reduce his cost and make up his mind. I calmly asked him why I would sell an engine to anyone who told me they didn’t want any instruction on how to operate it. I hope he is happy with the other engine, I don’t work with people who know the cost of everything but the value of nothing. Roger and his family impressed me as the perfect antithesis of such people. We have room in the Corvair movement for many types of people, but I can make a good argument that experimental aviation and flying in general has had quite enough of people who have no interest in learning anything. 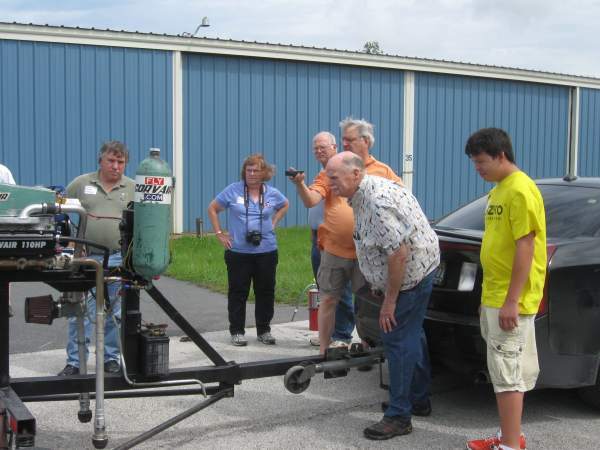 It has been a few weeks since Corvair College #23 here in Florida. I have a few stories to write up and share from the event. We have been busy heading into Oshkosh, which is now only a month away. We have ended up with a little free time because of tropical storm Debby. It has been raining cats and dogs over the past three days, but it is expected to peak tonight, where we can end up with another 4″ of rain on top of the 12″ we already got. As a precaution on flooding, we have shut down the hangar for a day and picked up everything near the floor and turned off the power. This involved picking up the TIG welder with the engine hoist and putting the planes up on ramps. It is a lot of prep work, but it prevents damage and we will be back in action the day after the storm passes. For now, it provides time in the house to write up a story from CC #23. Above, Corvair/KR builder Ray Fuenzalida from New Orleans. Ray has attended three other Colleges, but he decided to make #23 the special one and finish and test run his engine there. 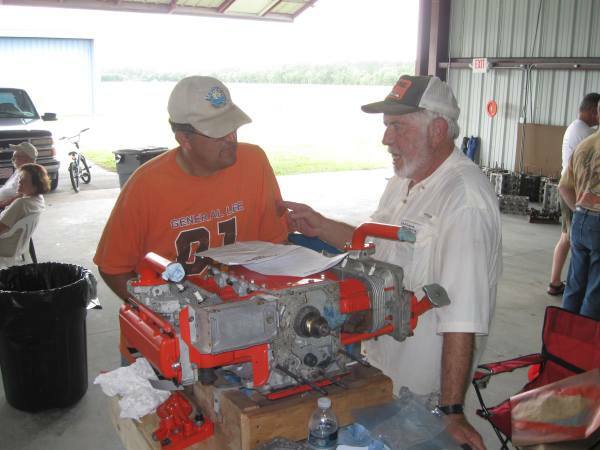 His basic engine is a 2700 with a Weseman 5th bearing. It will be more than enough power for an outstanding KR installation. 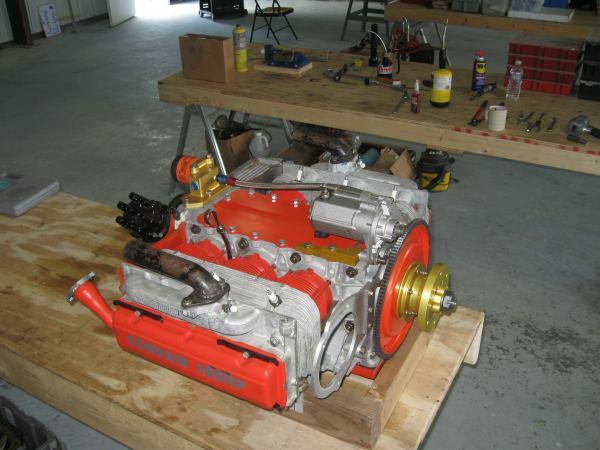 Over the years Ray had considered several different starter/alternator configurations, but after seeing a lot of finished engines run at previous Colleges, Ray moved to using our standard front starter/front alternator configuration, primarily because he liked the simplicity of it. In the photo we are admiring the diamond plate top cover Ray made. We said something about a guy in Lake Charles, Louisiana, with one running board on his 1970s Dodge conversion van being ticked off….. Above, Ray’s engine was about 1/2 complete when he brought it to the College, but we took the time to go over the engine with a fine tooth comb. One of the things we changed was his rear oil case. Ray’s core had come with an oil case from a 1960-61 Corvair. They fit, but they are a heavy sand casting. We replaced it with a die-cast one that had been fitted with one of our high volume pumps. The pump is a good idea with a 5th bearing. Standing with Ray is Dean Smith, long time Corvair movement guy, also from Louisiana. My talented and beautiful wife Grace painted the sign above. We have few rules at the Colleges, but we always abide by them. We lay off the top two subjects of conversation (as they rarely bring people together) and the third is that we teach builders to avoid products from totalitarian police states noted for poor quality. 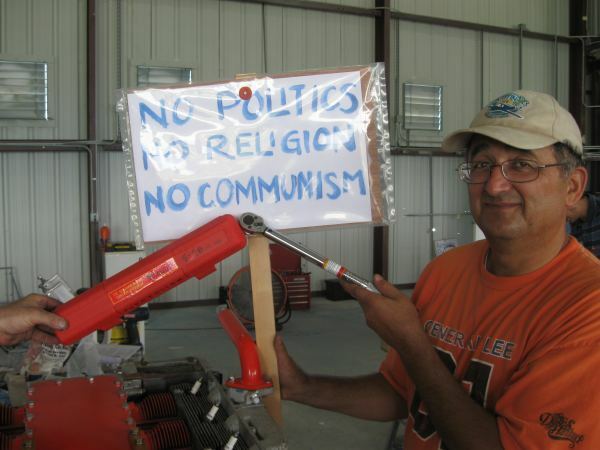 Ray has been a really good sport while we tease him about bringing a torque wrench made in the Peoples Republic of China. Over the years, I have shown many people that these are not accurate enough to build an aircraft engine with. Particularly offensive to me is the brand name “Pittsburgh.” I was born in the actual Pittsburgh in 1962. We bring a highly accurate Snap On digital torque wrench to every event so builders don’t have to worry about this if they are assembling at the College. For those working at home, I suggest a Craftsman beam type wrench in 3/8 drive. They are good and cheap. Above is a good overall view of Ray’s engine. Note the top cover has been replaced with our standard one, it is part of the Front Starter package. Ray painted it to match his engine. The diamond plate one was too thick and not smooth enough to mount the Front Starter Brackets. Ray also picked up our last non-anodized front Alternator Bracket. The only thing about Ray’s engine that is slightly different from our production 2700 engine is his use of bolt on head pipes. We used them for a long time, but every engine we have built in the past nine years had used welded on intake pipes. There is a slight flow increase with welded on pipes, but I particularly like eliminating the gasket. Our Intake Manifolds can be made to work with bolt on pipes, but they are really designed to work with welded on pipes. Mark at Falcon has a set of fixtures to do the job that are set to perfectly match our manifolds. Guys with personal skill at welding aluminum have purchased the manifold and used it in reverse to locate the head pipes without a fixture. If you do use bolt on pipes, do not use the gasket for a Corvair carb, instead use Clark’s part number C-12A, which is the gasket for the turbo intake on the car. Ray’s engine has a very clean look because it has only one external oil line, a -6 line right from the Gold Oil Housing to the Weseman bearing. His oil cooler is a stock GM unit. 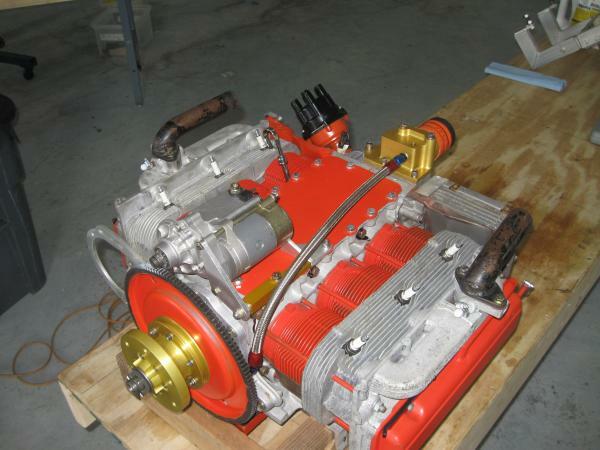 These have long proven to work on small, fast Corvair powered planes like KRs and Cleanexes. 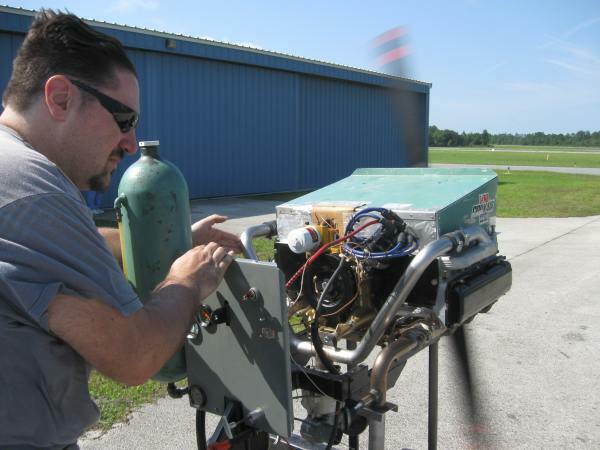 All of Dan Weseman’s hard-core 3100cc powered Wicked Cleanex flying was done on a stock 12-plate cooler. The faster the plane, the smaller the oil cooler required. Another look at Ray’s engine. Engines built with 5th bearings use the Short Gold Hub. For the past several years, we have used a sold Ring Gear in place of the 2003-07 model we used that had spokes. (It was an FRA-235 Pioneer, no longer in production.) The new model is from a late-model Ford. We buy them in the unmachined state from NAPA and individually machine each one on our lathe. This is a good view of our new Front Starter Bracket, which eliminates the drilled link of our previous starters. This new bracket comes standard on the starter we sell. We also have pre-made tail brackets for starters going on engines with Weseman bearings. The Fram 6607 filter shown is just for ground runs; we use a K&N 1008 in flight. Again, look at how clean the configuration is; it needs hardly more than plug wires and baffling to be installed. Ray’s engine will not need anything like the filter, cooler nor bypass mounted on the firewall. All of these are on the engine itself, which makes for a very organized engine compartment. When people arrive in the land of Corvairs, they are looking forward to learning a lot of things about the engine. I have a lot to share on the subject, but I do try to share some other things I have learned from many other aviators along the way. When you’re new to homebuilding, people often think of the mechanical things that they need to learn, but over time I understood that many of the most important things you can understand in aviation fall into the categories of judgement, philosophy, and the human condition. These are the hidden truths of flying. Popular magazines never touch these subjects either because the staffs don’t know them, or they would have a hard time tying them into sales of their advertisers’ products. Here, I am restricted by neither of these issues. I am free to share things that other people taught me, things that often came at considerable cost. Let me share something it took me many years immersed in aviation to learn: One of the most common human reactions to an accident or something going very wrong is an observer saying or thinking “If only someone had told him….This could have been avoided.” People new to aviation often have fears that they may not be told something in their training or building that would put them in such a bad position later. Experience has taught me that this concern is unfounded. In almost every one of the bad situations that I can draw to mind, it was not the omission of important data that caused the problem. In almost every case, the unfortunate person at the center had been told, often previously warned more than once, but they chose to ignore the warnings or discount them for reasons that frequently seem hard to remember after the damage is done. It is not the lack of information, but the willful choice to ignore it that is at the root of trouble. You can’t reach some people, and it isn’t your purpose in aviation to do so. That isn’t the focus here. What I would like to bring to your recognition is that you need to observe your own information reception from a third-party perspective. You can’t help people who don’t want to listen, but you can make sure that you are receptive to valid information, especially from people with specific experience, when it is delivered. In the course of my work I frequently have to tell people when something in their plane or the operation of it is a bad idea. We are not just talking about points of style, we are speaking of things that I know will not work or are specifically dangerous. Close observation has taught me that 50% of the people hearing what I have to say are developing a rebuttal or a defense before I get to the end of my second sentence. This isn’t a productive way to respond. I don’t mind any question, and I am prepared to explain at length. But many times the things I have to say are received by a person with their arms folded and an explanation that cites some local expert, a guy on the Net, or their Tech Counselor. If we were speaking of pickup trucks, sailboats or snowmobiles, you could understand people just wanting to be left alone to do it their way. Aviation has different consequences but often generates the same response to differing opinion, even when it comes from people with very specific experience. If you are new to homebuilding and even yet to solo a plane, I can say with confidence that you will do well, just as long as you are always ready to listen to experienced people who are trying to teach you important stuff. Would more people listen if I wrote it in shorter sentences? The Manual says “never fly any aircraft you even suspect may detonate.” A month ago I got an e-mail acknowledging this sentence and then asking if “some detonation during routine leaning to save fuel was ok?” I have said in countless places that you must have a cooling shroud on every engine during a ground run, yet you can see people going without it on YouTube for 6 minute videos. There is a big difference between honest errors and people who are trying to develop a rationalization for why they don’t have to follow anything I want to share. I have been working with Corvairs for a long time and I can say that people who read information, ask questions, develop their understanding and accept proven concepts are successful at a rate many times higher than people who treat their engine build with the same respect for directions that people reserve for the ones that come with particle board shelf units from Wal-Mart. Would people listen more if I told them that in 1/3 of the cases of people damaging or destroying Corvair powered planes, they were doing something that I had previously specifically asked the builder not to do in person or on the phone? Maybe a specific example is worth considering…..
Here’s a true story: Several years ago I am in my shop and working on distributors at nine o’clock at night. I get a telephone call from one of our successful builders (we will call him guy “A”) who has approximately 150 hours on his flying plane. He tells me that the next day his plan is to take another pilot flying (guy “B”), and give him a check out in his plane. To do this, he will be flying his own airplane from the right seat for the first time ever. Like his plane, guy A has 150 hours. Guy B is an experienced aviator who has not flown in a number of years. The last flight guy B had been on was as a passenger, and it ended in a crash which killed the PIC. Guy B was understandably nervous about going flying again. Upon hearing the plan, I tell guy A that this is the luckiest phone call he will ever make in his life. I flat-out tell him that I understand the good Samaritan motivation, but what he is thinking of doing is not just a bad idea, it’s insane. If you’re new to flying, here’s why: Flying a plane from the right seat is a normal skill that any pilot can learn, however it is always done with a real flight instructor in the other seat, who can anticipate and catch any transition mistake on landing. 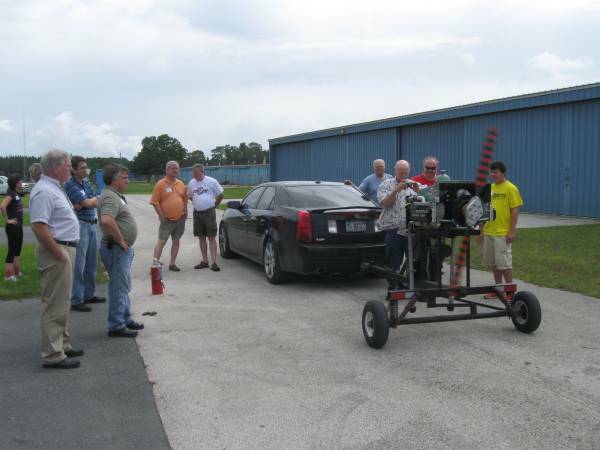 Second, people who have just been involved with an accident are very likely to flinch or freeze when confronting pressure, especially if they are in the same model of plane, or if it were a fatal accident, or both. I told him that likely the flight would go fairly well, but that guy B might have a serious problem close to the ground. The second part was a personal insight from being a crash survivor myself. We spent an hour on the phone and he offered his sincere thanks for my very serious and direct language. Does my approach sound like sticking my nose into other people’s business? Did I really need to come down on a guy who is just being kind to another builder? Think I was a little paranoid? I mean after all, we are all equals in this world, and the guy sounds like he was going to be careful, besides, you can’t listen to all of the long stories that guy William writes anyway…. Two weeks ago, we received notes on the same day from two different builders saying that their aircraft had flown on Corvair power. When we were getting started 20 years ago, getting two more planes airborne in a summer was getting something done. Today, after a lot of hard work, two in a day is a real achievement. This is progress, especially when you consider that both of these builders did a lot more than take an engine out of a box and bolt it on. Each of them built their own engine, and in the process learned a lot more than anyone just buying an engine could. The additional challenge that both of these builders faced was not only the unique installations required by their airframe choices, but also the fact that neither of these builders are located in the United States. 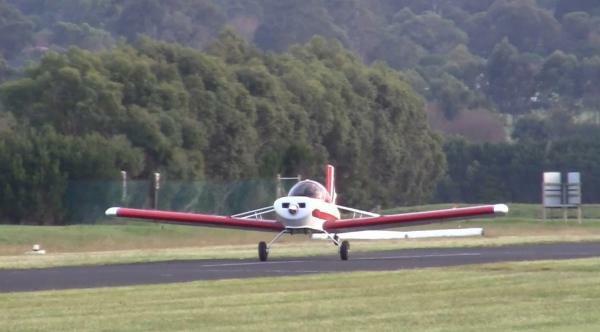 Above, Darren Barnfield’s VP-2 on its first flight, in Australia. It is powered by a 2700cc Corvair that uses many of our conversion components. The second aircraft is Jeff Moore’s Merlin on floats in Newfoundland, Canada. Jeff’s is the first Merlin to fly on Corvair power. After thinking about it, I looked on the Web to find an air miles calculator and figured out that these two builders are 11,350 miles apart. Yes, they truly are on opposite sides of the globe. Over the past 10 years, a handful of Corvairs have flown Down Under, and over the years, about 25 have flown in Canada. But the timely first flights of these planes gave me pause to think about how far the Corvair movement has come. Well the most amazing thing happened. My Corvair powered VP-2 has flown. We checked out the aircraft and did a few good runs. On the 3rd test the VP-2 just levitated off the ground and flew off into the distance. I haven’t had the chance to pull the cowls off since the first flight so will go down this week-end. Second, we are here for the long run. Darren’s adventure spanned more than a decade, several times the lifespan of most alternative engine companies, but just half of our time in the game. We will be here to help you, not just today, but for good. Third, no matter what your airframe choice, we are the best asset you have in Corvair powered flight. We have directly supported well over 90% of the Corvair powered planes finished in the modern era. Even engines not thought of as our standard conversions almost always utilize our ignition and oil systems. This is why every flying pilot has something good to say about us. The flip side is that the Internet has a number of people who continuously crop up to say that they are going to do something new and revolutionary with Corvairs, far from the things we teach people in our Manuals and DVDs or at the Colleges. The common thread between those Internet people is that they have no flight experience with the things they propose. No serious builder is served by a poor idea proposed by a here today, gone tomorrow Internet personality. Homebuilding is a difficult enough challenge without help from such people. 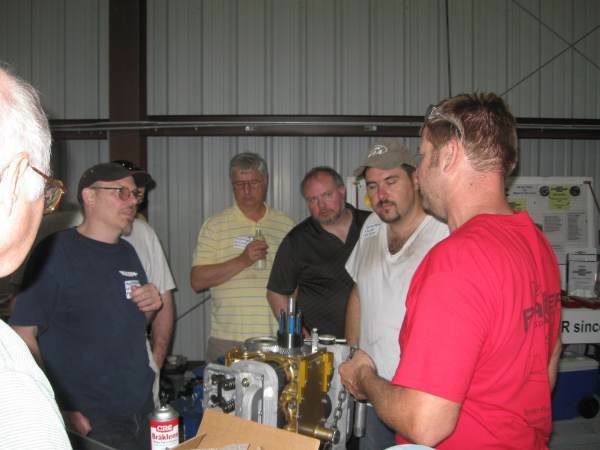 If you want to succeed like Darren and Jeff, the pattern is proven: Let us assist you with information, training, parts and components, and take advantage of all that we have learned and are more than willing to share. 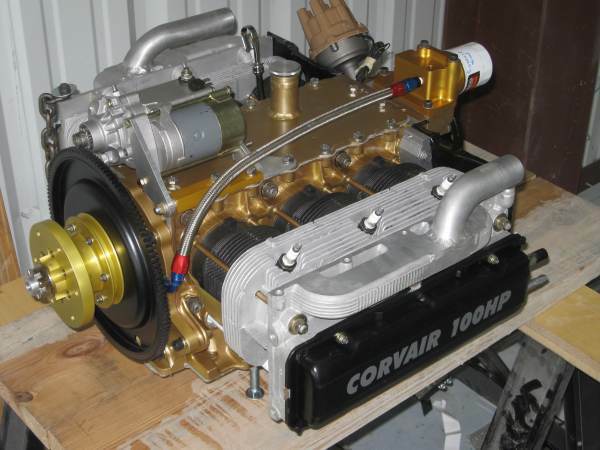 If you lived 1,000 years and everyone who started a homebuilt eventually flew it, it would still be a waste of time to get advice from people without a successful track record of working with Corvair flight engines. Unless you’re immortal, it is dangerous to try to fly unqualified advice. Truth is that we are here and capable of flying for a limited time and homebuilt completion rates are way below 20%. Crucial to understand: The successful builders are NOT chosen at random by fate from the pool of starters. The successful builders set themselves apart from the others with good decision-making. First and foremost in these decisions was choosing whose advice they would take, and whose they would ignore. Everyone understands that if you wanted to climb to the top of Everest, you would hire a Sherpa, and the first question you would ask at his interview would be, “Have you been to the summit of Everest?” If his answer was “No, but all mountains are the same,” only a fool would hire him. Yet countless builders over the years have essentially accepted such an answer when asking for aircraft building advice. The connection between mountaineering and homebuilding is that they are both very expensive, they both have low success rates, and they both have a terrible set of penalties for taking unqualified advice. I cannot sing nor dance, I will never graduate from charm school, and I have no valid advice on fashion or flower arranging. I cannot solve the Middle East peace crisis, I do not know the solution to the Riemann hypothesis, and I do not understand why some people drive Volvos. But, I do know Corvair flight engines. No one has guided more builders to successful flying. If your goal is to get to the top of this mountain, I am here to be your sherpa. I wrote this piece about my Father in December of 2009. It originally appeared on our main Web page, FlyCorvair.com. If you have joined the Corvair movement since then, please take a few minutes to read the story. Every good quality I may have is directly attributable to my parents. On this Father’s Day I share this story because my Father remains the hero of my life. This week marks the 84th Birthday of my Father, William Wynne Sr. To commemorate the day, we share three photos from the family archives. Above, on the left, my Father stands in the rubble of the AT&T building in downtown Seoul, Korea, in 1952. At the time, my Father was a company commander with ACB-ONE, a U.S. Navy Seabee battalion which landed at Inchon. The South Korean capitol is less than 50 miles from the border with the North. It began to resemble Leningrad because it changed hands several times during the War. In 1974, my family toured South Korea, and it was a bright, thriving country, without an external trace of the conflict it had survived. Its vibrant character was a testimony to its people. George Orwell was thinking of Stalinist Russia when he wrote 1984. Seven decades later, I think North Korea is actually the country that bears the greatest likeness to 1984. Kim Il Sung really is “Big Brother,” and just about every facet of the book is a fair description of life in the North. The North Koreans live under a maniacal regime that controls every detail of life, squandering its meager wealth on nuclear weapons and missiles while its people starve in the cold. In utter contrast, the South Koreans live in a society with a first world standard of living and freedom undreamed of by their Northern brothers. The Koreans suffered horrific losses during the War, and their dead were joined by 38,000 Americans whose sacrifices prevented the North from enslaving the South in their nightmare. My Father’s 33 years in uniform were guided by a single principal: No human being, regardless of race, faith or nationality, deserves to live in a totalitarian police state. While most people would agree with this, my Father is one of the men who care if this is happening to families on the other side of the globe, even if they are not Christians, don’t speak English and don’t have anything America needs. Just being a human trying to raise a family in peace is enough. My Father is a realist who understands that the last resort will always be free men with weapons meeting the totalitarians in battle. Since he joined the U.S. Navy at age 17, he has been willing to be one of these men. Yet my Father did not fight with just the tools of war. He felt that ending a violent communist insurgency in Northern Thailand in 1972 was a major triumph. His “weapon” that gained the loyalty of the Hill Tribes was providing medical care for their families. Most Americans of a certain age can recall some of President Kennedy’s 1961 inaugural speech: “Let every nation know, whether it wishes us well or ill, that we shall pay any price, bear any burden, meet any hardship, support any friend, oppose any foe, in order to assure the survival and the success of liberty.” These were not mere words to men of my Father’s profession, it was a cause to pledge your very life to. My Father did not care if the poor of the world chose collective farming or workers wanted social reforms. He just recognized that political systems that don’t value individuals always degenerate to Gestapos, concentration camps, gulags and mass graves. My Father fought to stop the spread of these things. In the china cabinet of my parents home in New Jersey sits an engraved brass plate. It was given to my Father in 1974 by Commodore Vong Sarendy, Chief of Naval Operations for the Khmer (Cambodian) Navy, to thank my Father for his efforts to thwart the communists in Cambodia. Before his acceptance speech, my Father was warned by the U.S. State Department that he could not promise further aid. It had only been 13 years since we promised to “pay any price,” but Washington had changed. The Commodore bitterly understood this, and told my Father that the Americans could go home, but he and his family would fight to the death. They did. Within a year, Pol Pot and the Khmer Rouge controlled the country and exterminated several million people. Being able to read and write was cause for being sent to the killing fields. I love my country, but holding that brass plate in your hands, it is easy to understand that our two biggest flaws are a short national memory and the fact that the average American has no idea what the term “totalitarian police state” means. People who have never read A Day In The Life Of Ivan Denisovich think you can understand what cold is by watching the Weather Channel; people afraid of the dentist glibly discuss torture in foreign places; TV commentators call each other Nazis over pathetic small differences while a tiny group of elderly Americans with small numbers tattooed on their forearms know the real definition of the word. In the above photo, my Father stands with my brother Michael and sister Melissa in front of the world’s first atomic power station, Shippingport, Pennsylvania. The photo is from 1959. The reactor was tha same design that the U.S. Navy used in its ships and submarines. My Father was the project officer working directly under Admiral Hyman Rickover. My Father has been a stalwart proponent of nuclear power for the past 60 years. It was a very different time in America when a town was proud to be chosen for such a project of national importance. After retiring from the Navy in 1976, my Father went to work at the Princeton Plasma Physics Laboratory. The project was the world’s first fusion reactor. Few people in the general public understood the potential of fusion to produce unfathomable power without generating radioactive waste. After Three Mile Island, the public turned against atomic power of all types, and the country blindly went back to building coal and oil-fired powerplants. Many of the anti-nuke protesters of 1979 are now climate change activists, missing the role they played in the U.S. staying dependent on fossil fuels that are at the forefront of the climate debate. If you have ever wondered how France, a country of 60 million people with no hydro power, nor coal or oil reserves, can afford to be a tireless critic of U.S. Middle East policy, the answer is simple: Virtually all of the electricity produced in France is generated in nuclear plants. By far, the greatest joy of my Father’s life has been being married to my Mother for 59 years. The above photo was taken circa 1949. They met at the New Jersey Shore just after World War II. Throughout my entire adult life, whenever I encounter anyone in difficult straights or a terrible position, my first thought is always “without the luck of being born to my parents, that could be me.” It is not possible to overstate the positive role my parents have played in any qualities of character I have. In this Holiday Season, I have a multitude of things to be thankful for, but this always is first on my list.